My TV antenna is just a pipe sticking out of my roof that’s bolted to the roof trusses, this is just fine for a TV antenna although it does get a bit squeaky in high winds. I have other plans for it though – mounting a PTZ (pan, tilt, zoom) security camera to it. In recent months I have noticed an increase in crimes around my area, mostly thefts from houses and cars parked out the front. Where I live this kind of crime was never common, but things are changing and I want to put some measures in place that may not prevent the crime but will at least give me some evidence that can be presented to police in the hopes of aiding an investigation. Ive spent quite a few weeks researching the different types of cameras and video recorders on the market to find the best solution for my needs. I have decided to start with just a single PTZ POE camera with an 8 channel NVR that I will later on add more cameras for specific positions around my house. The PTZ camera mounted up high will give me a good overview of my entire house so it seems like a good place to start. The TV antenna wasn’t at first an obvious spot, most camera set ups I’ve seen are a series of dome or bullet cameras at specific points around a property, I was just going to do this and be done with it. But the idea of having an overview camera PLUS specific points seemed to be more of an all-round set up. So with the wobbly antenna in mind I started searching around for roof anchors to suit my tiled roof, what little is available off the shelf was far too costly for what I was getting, value for money is important to me, and in a situation like this I like to set a challenge for myself – make something exact to my needs with as low as cost as possible. 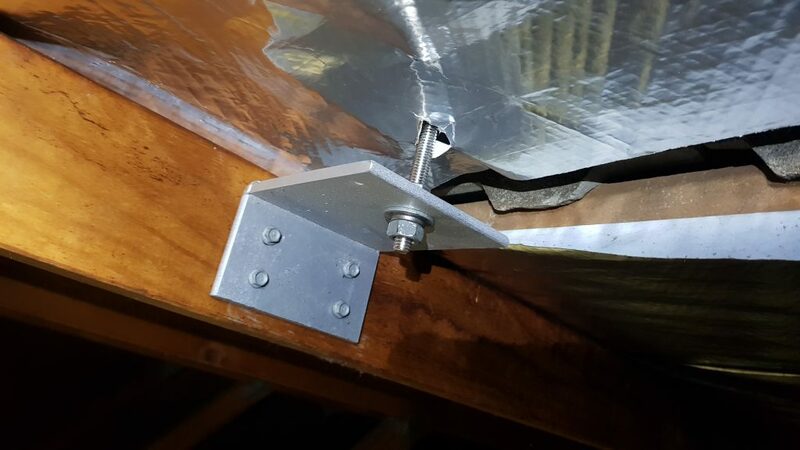 The roof anchors basically consisted of angle iron that screws to the truss with an eye bolt that goes through the tile and bolts to the angle. I had some good 6mm steel scrap plate lying around that would be perfect for making the custom sized angle irons I needed, 316SS eye bolts from Bunnings were only $7 a piece, so apart from my labour these anchors were going to be dirt cheap and perfectly suited to the job. The angles will be under the tiles so there is no need to make these from stainless steel like some of the products I found. 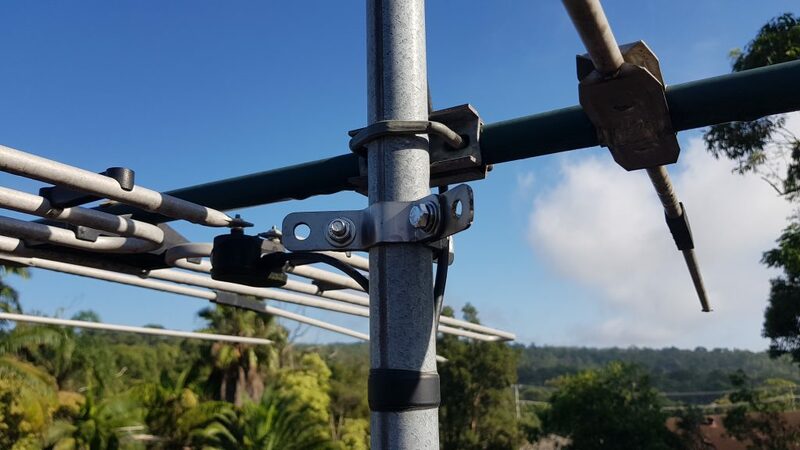 I then needed an anchor point on the antenna itself, I looked around at what was available online and one particularly simple design caught my eye – 3 folded plates that bolted to each other, that would then clamp around the pipe and provide and eye hole for stainless steel cable to go through. 10 mins spent in Solidworks and my design was done, customised to suit my antenna pipe exactly. 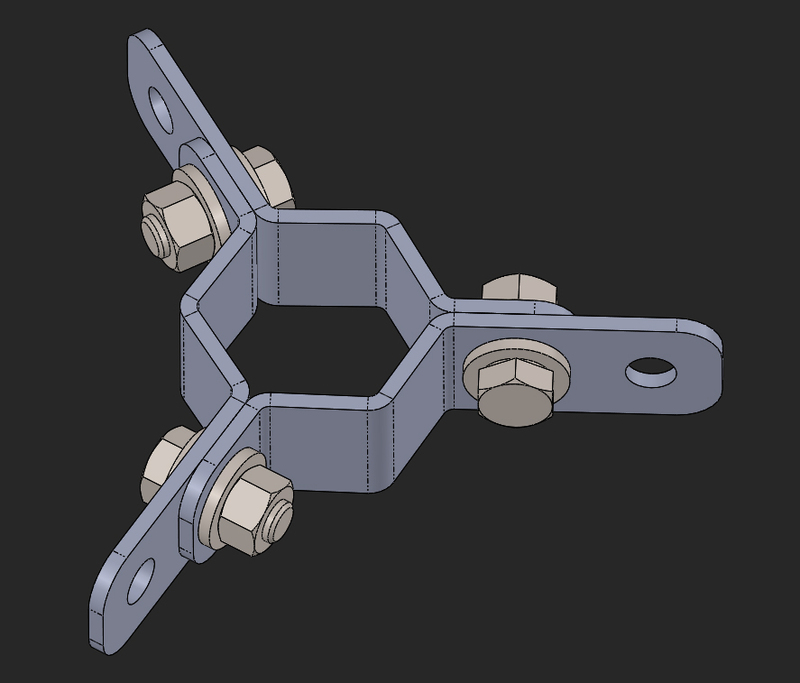 With all the parts now designed and made (for less than $40 so far) I was ready to purchase some turn buckle kits that go for about $30 each which will give me a rock solid mounting position for the 2.5kg PTZ camera. Ill post a final install blog in the coming weeks, thanks for reading.